Easy Microwave Steamed Salmon recipe, now you can cook salmon at your home. This recipe will help them who don't know how to cook salmon at home. lest follow steps how to cook microwave streamed salmon at home. Here is what you'll need to cook Easy Microwave Steamed Salmon to serve 1. Cut a piece of parchment paper in the shape of a square. Slice the onion thinly. Julienne the carrot. Cut the bottom of shimeji mushroom and tear into bite-sized pieces. 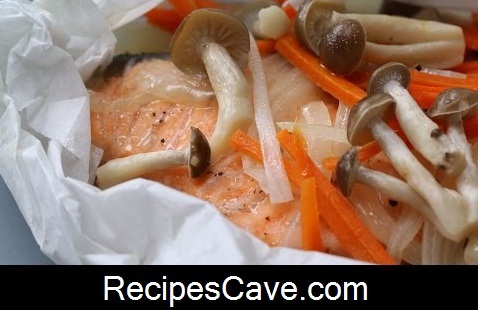 Place the salmon at the center of the parchment paper. Season with salt and pepper. Place onion, carrot and shimeji in the order. Sprinkle sake and put the butter on top. Bring up the top and the bottom corner of the paper. Fold the top corner for 3 to 4 times. Twist the ends. Place the salmon packet on a microwave safe plate and microwave for 4 minutes, or cook in 350°F/180°C oven for 20 min. Open the parchment paper carefully and drizzle soy sauce on top. Your Easy Microwave Steamed Salmon recipe is ready.